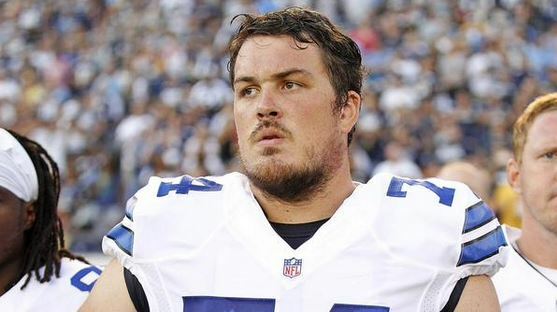 Dallas Cowboys offensive tackle R.J. Dill has been suspended for the first four games of the season for violating the NFL’s performance enhancing substances policy, the team announced Friday. Just announced that R.J. Dill has been suspended the first four games of the season for violating the NFL's PED policy. Dill has a special case, and released a statement through the NFLPA explaining the circumstances surrounding his suspension. "I want to share personal details about the circumstances surrounding my suspension because there is a stigma associated with a suspension under the Performance Enhancing Substances Policy that is unwarranted in my case. In August 2014, I thought my dream of playing in the NFL was over, and I began to transition away from professional football. During these months away from football I noticed a drastic change in my energy and activity levels, so I saw my doctor, and blood tests revealed that my testosterone levels were very low. My doctor suggested that I undergo testosterone replacement therapy, and I accepted the recommended treatment. I completed one round of testosterone replacement therapy in November of 2014, and almost immediately, I felt like my old self again. At this time I was not under contract with any NFL team, nor was I actively pursuing an NFL career. "Then, in January of 2015, I unexpectedly received a call from the Dallas Cowboys. They were interested in signing me to a futures contract, and after passing a physical, I signed a contract and immersed myself in training for the 2015 NFL season. Unfortunately, my excitement was subdued when in May 2015 I was told by the NFL that I had failed a drug test. While my doctor had told me that the residual amounts of the testosterone would be out of my system about eight weeks after treatment, that was not accurate, and I failed a drug test a full six months after I had received the prescribed treatment. "Since being notified of my failed test, I attempted to secure a Therapeutic Use Exception (“TUE”) from the NFL, but was it was denied because the NFL only permits exogenous testosterone treatment in extreme medical situations. I consulted with my union after the positive test and learned that even in these circumstances, the NFL imposes discipline because having the intention to cheat or break the rules is not required for a violation of NFL’s PES policy (or any workplace drug policy). It is very difficult for me to accept that a suspension is imposed by the NFL after I followed treatment prescribed by a medical professional during a time when I was not employed by an NFL team. In my view, this situation carries the weight of an unforgiving label, ‘cheater,’ which I am not. I live with integrity, on and off the field, and I want people to understand the factual circumstances of my suspension, so that they, and the NFL, understand that I never sought a competitive advantage. Finally, I would like to thank my family, friends, and the Dallas Cowboys organization for their continued support." The NFL just pulled an NCAA move with this verdict.